Tuesday May 31 the last day of May. The forecast for today is sunny in the morning and cloudy with a chance of showers in the afternoon. Phil did a couple of errands early this morning. The first was to get a baguette and a croissant for breakfast. After breakfast it was a quick trip to the Intra-Muros marché for strawberries, green beans, apples, pears, and bananas. Sandy spent most of the sunny morning on the balcony enjoying the sun. Sandy enjoying the sun on the balcony, but hiding behind a geranium planter. Sandy on the sunny balcony letting her feet get some vitamin D.
One of the awnings had a bit of a problem. The felt-like lining had come undone and needed to be reinserted into the awning frame. It took only about 45 minutes to fix the problem and hopefully it will not recur. After lunch we headed out to our French lesson at Christine’s house. On the way we had to stop at the gare to change buses. Since we had a few minutes between buses we stopped at the gare to get our bus passes for June. We got our bus which dropped us very close to Christine’s house. That was part of our plan to allow Sandy to walk a bit today, but not too much. At Christine’s Sandy got to explain her foot problem and our visit to the doctor. It just so happens that Christine is friends with the doctor. This is a pretty small town. 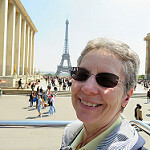 We discussed how we had to cancel our trip to Normandy, but that we were planning to go as soon as we could reschedule. While we were at Christine’s house it did rain but just a little. On our way from Christine’s house to the bus stop we passed a beautiful rosebush. Just had to take a picture. Lovely roses growing in a garden. When we got back to the Intra-Muros we stopped at Macaron Simon boulangerie to buy a baguette and a tasty treat for dessert. It look great and tasted delicious. A delicious dessert from Macaron Simon. We don’t even know the name of the pastry, although it was a hazelnut something or other. At the end of the day Sandy had no additional problems with her foot. In fact, things seem to be rapidly improving. Very good news for all of us.